Sandra Gould, known to many as the second Mrs. Kravitz on Bewitched, was born 98 years ago today. She died in 1999. Gould assumed the role of Mrs. Kravitz in 1966 following the death of Alice Pearce, who had originated the role. Gould’s Mrs. Kravitz was a bit more antagonistic towards the Stephenses, always wanting to report them to the authorities. Nevertheless, the Stephenses were kind to her—for example, they took her in when she and Abner separated in the episode titled “Splitsville,” even though she came to breakfast wearing curlers in her hair and a face full of cold cream and lectured them about nutrition when they didn’t have any wheat germ oil. Gould guest starred on many TV programs in the ’50s, ’60s, and ’70s. 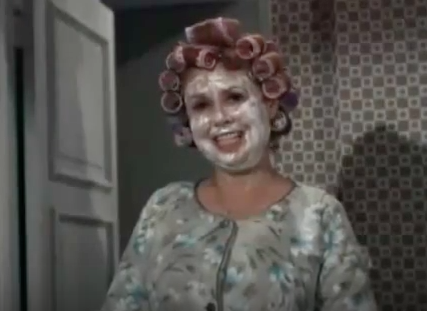 She appears in the “Oil Wells” episode of I Love Lucy as a Texas oil tycoon who, with her husband, sells oil wells to the Ricardos and the Mertzes. 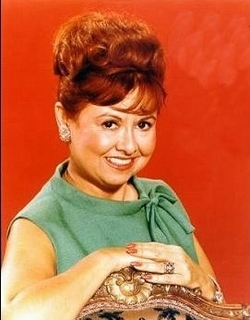 I also remember her from a Brady Bunch episode in which she winds up stuck in a closet in the Brady house with a goat. I know it sounds strange, but it will make sense if you watch “Getting Greg’s Goat” below. The goat in the closet scene starts at 22:01. If you are a Sandra Gould fan, you might also enjoy this novelty recording of hers from 1963. It’s called “My Son the Surfer.” You’ll definitely recognize the voice.